This site has been up for nearly 4 years now and amassed almost 2,000 stories, so we’re always trying to find new ways to flip back in time and remember the random St. Louis oddities of years past. Pretty straight-forward: Load the page, get a random story. There’s little url that you can copy for Tweeting and the like, and you can click the story preview to read the whole thing. Simple and effective. Welcome to the new thing you’ll keep refreshing instead of doing work. This new page shows you all of the stories that were posted on this date, which sounds odd, but in practice is pretty fun. For instance, did you know that today, September 21st, is the same day that we reported a guy broke in to someone’s house only to cover the insides with soap, and that a local Dairy Queen sign was promoting a “reefer bash”?! You know now! 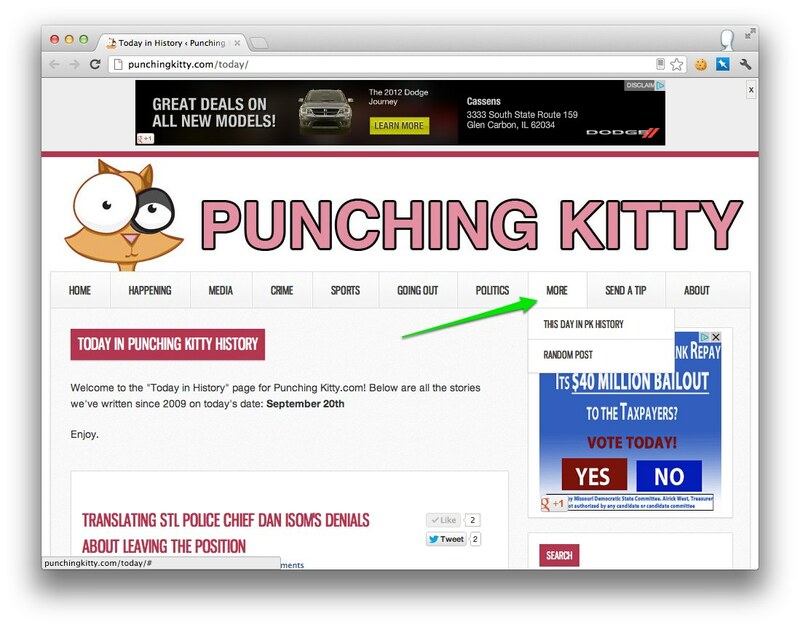 Thank you “Today in Punching Kitty History” page! Every day it changes, so…you know…come back every day. Even though this has nothing to do with finding old articles, for some reason we also feel like pointing out we have a few easter eggs on the site as well that it appears no one has found yet. You’ll know if you found any of them.